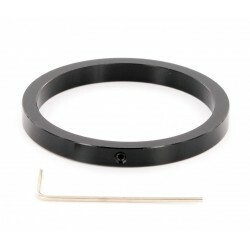 Size: 2" Parfocalizing rings are one of the most useful gadgets in astronomy. They can be used for several purposes. FULL Parfocalizing Ring Set Shown (5 rings/5 wrenches). This listing is for 1 2" ring & 1 wrench NOT the set. Parfocalizing rings are one of the most useful gadgets in astronomy. They can be used for several purposes. If you would like to make your non-parfocal eyepiece set parfocal you can put one of these rings on each eyepiece and adjust the height so that all eyepieces are at the same focus point, now when you swap eyepieces you won't need to refocus every time! 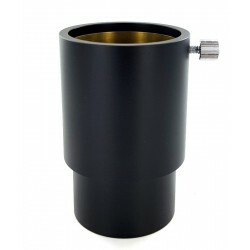 But they are most useful for achieving easy sharp repeatable focus during astrophotography. Here's how to make an eyepiece parfocal with your SLR/DSLR camera. First select an eyepiece with a field of view about the same as your camera, slip the parfocalizing ring over the lower barrel and slide it all the way to the top and snug the setscrew down to hold it there. Now, mount your camera to your telescope and take it outside, preferably in the daytime. Viewing through the camera viewfinder focus on a distant object such as an antenna by using the telescope focus knob. Once you have achieved the sharpest focus possible you can very carefully replace the camera with the selected eyepiece (or if you have a flip mirror such as in an ETX just flip to the eyepiece). Be careful NOT to touch the focus knob. Instead slide the eyepiece in and out very slowly until you get perfect focus through it. Lock the eyepiece in place. Lower the parfocalizing ring as low as it will go and tighten it. Now you have a very handy eyepiece that has roughly the same field of view as your camera, and EXACTLY the same focus point. No more squinting through a dim focus screen trying to focus on something you can't even see. Just focus using your parfocal eyepiece, then change to the camera and take the shot! 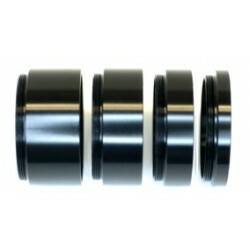 We carry parfocalizing rings in both 1.25" & 2" sizes. Sold individually and by the set. Each includes a wrench.